Melanie Benson left her corporate career at Motorola to launch her own coaching business. Now fourteen years later, her amazing coaching business, Success Connections, has grown immensely to a 6-figure, and sometimes 7-figure, business. The mission of Success Connections is to help entrepreneurs optimize their time and resources, helping them not to feel so overwhelmed. Now known as America’s leading small business optimizer, Melanie Benson has over 14 years of mentoring thought leaders and big thinking entrepreneurs. She helps the entrepreneur to free themselves up to do more of what they do best, uncovering and removing costly breakdowns and derailers. Melanie has leveraged her expertise by building out products that could help so many more entrepreneurs than she was able to one on one. Melanie’s been on faculty with StomperNet as their delegation expert, spoken on stages around the world, is co-author of Entrepreneur.com’s Start Up Guide to Starting an Information Marketing Business and has her success tips featured in magazines such as American Express OPEN, Bloomberg Businessweek, Parenting Magazine, Phoenix Focus and Women’s Day Magazine. 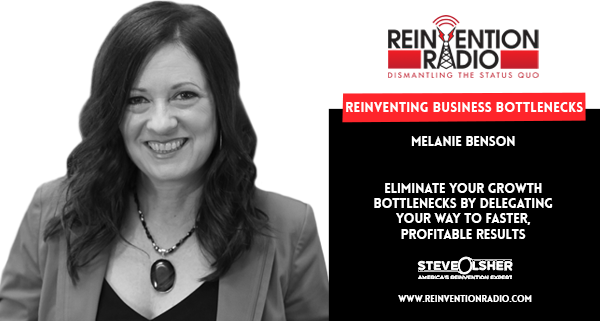 TUNE IN to this episode as Melanie chats with Steve, Mary and Richard about how to eliminate your growth bottlenecks and delegate your way to faster, more profitable results. 2 – The delegation dilemma; Enrolling others in your vision; Quit thinking about the cost, it’s an investment in your business; What are your super powers? Reinventing Self Education – In this episode, Pejman Ghadimi chats with Steve, Mary and Richard about self education, understanding and uncovering your greatest potential and your own purpose. Trying to rebrand myself and business or give up. Had aggressive idea for a not-for-profit but it would be a difficult, time consuming effort for one person. Not sure in which direction to go.